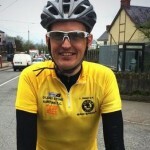 July 28, 2014 – Fergal May’s emergence as Leinster’s leading A3 time-triallist has put him on course for St. Tiernan’s Racer of the Year title. An untimely puncture on stage one of Kanturk in May caused the 7ft 3ins rider to put in an effort he felt finished his TT hopes for the following day. However, he blitzed the 8km course in 11’26.50″ – nearly five seconds faster than the runner-up, Comeragh’s Noel O’Dwyer. The performance confirmed his hidden talent saw him wear the yellow jersey on the final two stages. 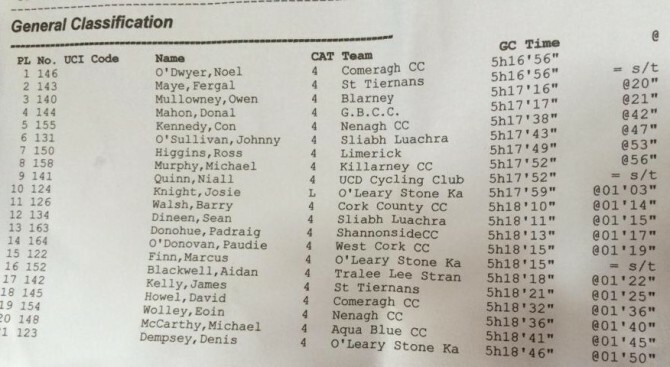 He lost it on count back to O’Dwyer, but went on to win the A3 Leinster 25m Championships in 55’27”. 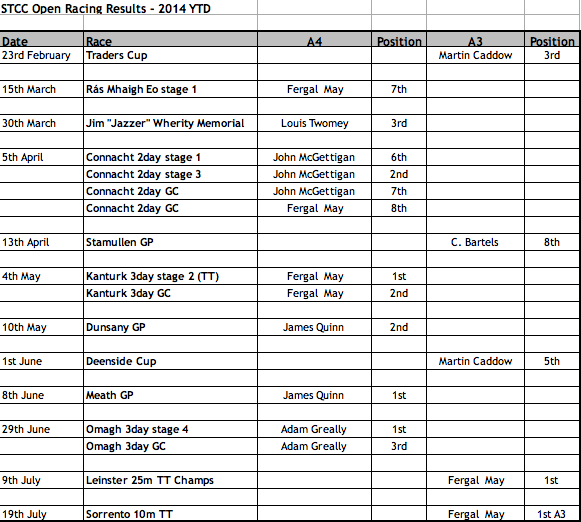 When St. Tiernan’s racing co-ordinator Richie Gallagher released the latest update on 2014’s open racing results, his continued strong form sees him featured six times on the scoresheet, which includes the hugely popular win of James Quinn at the A4 Meath GP and Adam Greally‘s impressive final stage victory at the A4 Tour Of Omagh. With not two months left of the road season, May is a certainty to make Gallagher’s shortlist for Racer of the Year, a prize to be presented for the first time at the 30th Anniversary Celebrations in October. Club Champion John McGettigan’s hot form at the Connacht Two Day puts him on the map too and leading A3 rider Martin Caddow is another already booked to go to the public vote with the remainder of the shortlist ten in late September. There are still places up for grabs though and plenty of riders improving towards a strong finish to the term, with a big team building for the Wexford Two Day at the end of August, the Vets’ and Women’s Championships rescheduled for September 20 and huge interest in the very limited St. Tiernan’s places in the Friends First Laragh Classic fields. It’s all to play for. Can you catch May? 2 Replies to "TT star May favourite for Racer of the Year"
The best reporters never, ever let facts get in the way of a good story.